The AMRC Training Centre in Rotherham is highlighting the success of its apprentices during National Apprenticeship Week 2018. The AMRC Training Centre is a £20.5m centre on the Advanced Manufacturing Park (AMP) where the focus is on students aged from 16 upwards, taken on paid apprenticeships. Part of the The University of Sheffield Advanced Manufacturing Research Centre (AMRC) with Boeing, apprentices have opportunities to progress on to postgraduate courses, doctorates and MBA levels. Sponsoring companies range from global leaders such as Rolls-Royce to local high-tech supply-chain companies. During the week employers and apprentices from across England come together to celebrate the success of apprenticeships whilst encouraging even more people to choose apprenticeships as a pathway to a great career. The AMRC's current Apprentice of the Year is heavy duty diesel engine builder, Leigh Worsdale, who trains at the AMRC Training Centre and is employed by Chesterfield company Foxwood Diesel. A trip to the USA hosted by Boeing followed the award success, where Leigh enjoyed a tour of the aerospace giant's sites in Los Angeles, Portland and Seattle - learning more about the world-renowned manufacturer. A number of awards and experiences followed. Leigh Worsdale, apprentice at Foxwood Diesel, said: "It's been an amazing experience! It's great to have your achievements recognised in that way, especially by Boeing. "I was also invited to demonstrate Industry 4.0 technologies to Members of Parliament at a High Value Manufacturing Catapult event at the House of Commons; it's a big honour to be seen as a representative for the AMRC Training Centre." Daniel Ryan, who completed an apprenticeship in Business Administration level 2 at the AMRC Training Centre is now an administrator at AMRC's Factory of the Future, also on the AMP. Daniel said: "I've never felt as proud of myself as I did at the end of my apprenticeship. It was a sense of relief but most of all, I'd achieved a qualification that I'd never dreamed of getting a few years before. 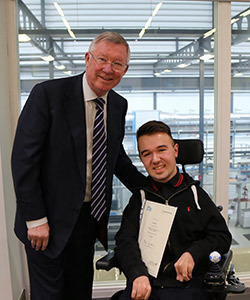 What topped it all off was receiving my apprentice completion certificate from Sir Alex Ferguson. I'm a big football fan so meeting one of the sports greats was the ultimate honour and it was such a surreal moment having him congratulate me on my achievement. I will treasure the memory for the rest of my life. "I am loving my time at the AMRC and want to carry on progressing. I really feel that I'm now part of the team. Without the apprenticeship I wouldn't have had the confidence to carry on and strive to be the administrator I am now, building stronger relationships with colleagues each day." Apprentices benefit from gaining experience and having opportunities for career development, at the same time as being able to earn a wage. 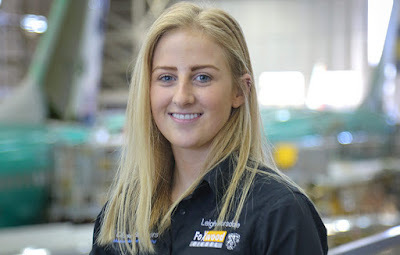 Leigh encourages anyone considering an apprenticeship to go for it: "Do it! Anyone can be successful, my story isn't unusual, I just work hard and I am given the right focus. I still feel like there is still a stigma to undertaking an apprenticeship, but now things are changing and the benefits, not just for the young people but for their companies and UK industry, are finally being seen. "Apprenticeships really do make a difference to the lives of young people, I am evidence of that!"